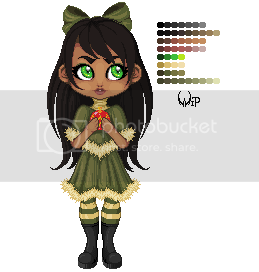 I think I was able to use all of the palettes in this. He looks awesome! Maybe Bright Blue like the original doll for his shirt or orange like SnailorBee suggested. Thanks guys! I've updated my WIP. Looks good so far, maybe rip the shirt with some fur sticking out on his shoulder with the clawed hand? @ Axxkat - *blushes* aww thank you! I'm so glad you like her! @ Consonanta- Thank you so much, She's awesome! I love it! and I think I'm done. :3 any CC? I think I'm done. any CC before I send her in? 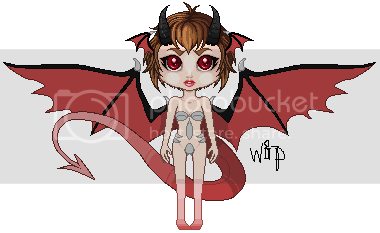 Added hair, stockings, and boots + started shading.